It doesn’t matter who we are, it seems as if we have at least one friend who is creative. Perhaps we would like to be creative as well but we don’t feel we have the ability to do so. More than likely, it isn’t because we are lacking in creativity but we may be lacking in confidence. That is why you’re going to love this fantastic project because anybody can do it and the results are phenomenal. One of the projects that many people enjoy doing is making their own soap. They may make it for their own use around the home or perhaps they make it to give as a gift to others. Regardless of why you decide to make it, it certainly can be a wonderful treat to see the work of your hands turn out so beautifully. Soap comes in many different shapes and sizes and some of the recipes are going to be easier to make than others. That is what makes this project so fantastic. It is easy to do but by adding a few simple colors and using just a little bit of creativity, you can make them look like gemstones. In fact, you may find that these soaps are so beautiful that you don’t even want to use them for their intended purpose. I wouldn’t be surprised to find that some of these are going to last for many years. After all, who would want to wash their hands with something this lovely? Although you can make these a decorator item, they are easy enough to make that you could find a use for them as well. Put them at the sink and use them regularly. When they are all used up, just make some more. 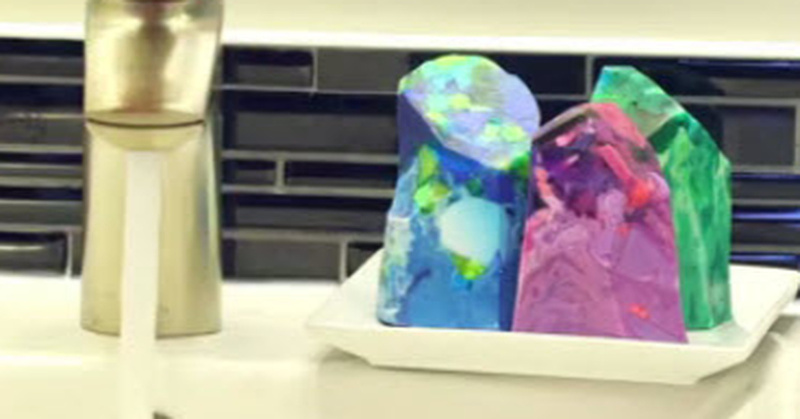 Flip over and pop out the little soap disks and slice them into shards and start mixing them up in your soap mold! Don’t worry about being too uniform, keep them random and don’t worry about packing them tightly because you will fill in the space after. Use your paring knife to cut 5-6 vertical edges along the sides. Use another 5-6 angles to bring the top to a point and you’re done!